Keira Knightley shines as Gretta, a singer-songwriter in John Carney's Begin Again. It’s easy to get cynical when you’ve watched thousands of movies. You recognize the normal story beats and how filmmakers set up familiar conflicts for their characters. Even so, I've mostly stayed optimistic when it comes to films with the right heart. Can a song save your life? Probably not, but I love the sentiment. When Sonny proves his musical talents in the final concert of Honeydripper and saves the day, I'm right there with him. Jude singing “All You Need is Love” at the end of Across the Universe is obvious, yet it still gives me chills. A perfect example is John Carney’s Once, a subtle love story where the Guy (Glen Hansard) and the Girl (Marketa Irglova) connect through the music. It’s quickly become one of my favorite movies, and a main reason is the sense that the songs mean something. They aren’t just pop tunes to play in the background. The music is essential to their lives, and Carney shows how powerful art can be to overcome heartbreak. That positive feeling remains in Begin Again, his first major follow-up to the breakout hit. 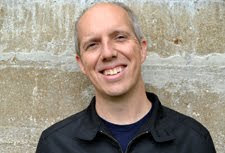 Carney played bass in Hansard’s band The Frames in the early ‘90s. He’s drawn to stories about tortured artists re-igniting their passions. This version of New York City is less gritty than the Dublin of Once, but there’s a familiar sentiment. Gretta (Keira Knightley) is struggling after breaking up with her boyfriend and music partner Dave (Adam Levine). He’s become a pop star and evolved into a different guy than the one she loved. Gretta still believes in “authenticity” from artists despite the difficulty for anyone to maintain that standard. Even a guy like Bruce Springsteen is still putting on a façade for his audience. They aren’t seeing the real person, though it’s probably closer than it is with others. When Dave starts talking about pleasing fans and his bosses instead of himself, he sets a dangerous precedent. Judging by the slimy CEO (a Rob Morrow sighting! ), it’s easy to see what Carney thinks of record label execs and their interest in creating good music. The other major character is Dan (Mark Ruffalo), an independent producer whose life is falling apart. After losing his family and his job, he stumbles into a bar with the intent to drink the night away. By pure chance, he hears Gretta perform “The Step You Can’t Take Back” at an open mic. This moment is replayed multiple times in the film and changes the course of both their lives. When we observe the scene from Dan’s perspective, Carney uses a inventive device that could so easily go wrong. Dan's mind brings the other instruments alive on stage to help Gretta deliver a sweeping pop version of the acoustic song (at least in his head). Dan’s imagination fills in the gaps, and it’s easy to see why he’s so inspired. Whether you buy this moment will say a lot about this film’s success. I was hooked and dove headfirst into the emotional sequence. Ruffalo plays the scene like a drunk, idealistic guy who’s mesmerized by hearing anything with a bit of substance. Beyond the individual song, this sequence is the mission statement for the mood that Carney sets with the entire movie. 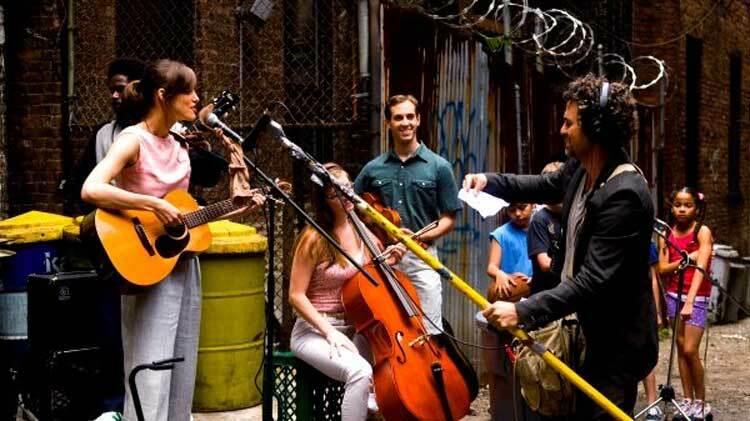 Mark Ruffalo's Dan orchestrates the outdoor recording in a New York City alley. It’s easy to overuse the word “charming” to describe this film, but that’s my best description. When Dan and Gretta recruit musicians for their outdoor album, there’s an endearing charm that’s hard to capture. It recalls the moment in Once when a serious loan officer breaks out a guitar and shows off his moves. There’s a fine line between cheery fun and painful sentimentality, and your bar for this type of material could vary substantially. Mine is very high when it comes from a guy like Carney. He use an effective structure that shifts around in time without feeling jarring. Gretta watches a video of happier times with Dave, and then we flash back to that moment and others that shaped their relationship. The editing slowly paints a picture of how she reached her current state without being confusing. Carney doesn’t get too cute and connects the dots like a skilled musician. Begin Again really hits its stride during the outdoor recordings, which play like music videos in a similar way to Stuart Murdoch’s God Help the Girl. The first band performance of “Coming Up Roses” culminates all their work to build the group. It feels like a triumph no matter what happens with the album. The upbeat “Tell Me if You Wanna Go Home” happens on a rooftop and strikes just the right emotional notes (along with a screaming neighbor). It reveals progress for Dan’s relationship with his daughter Violet (Hailee Steinfeld), who’s a surprisingly adept guitarist. The group is more than just a loose collective and has become a real band. My cynic’s brain was totally shut off by this point. I was gliding along for the ride with a huge smile on my face. A main reason was Ruffalo’s joyous, dorky commitment to Dan’s enthusiasm. He loves the music so much and is feeling the magic once again. Dan and Gretta just enjoy the music in a thrilling night in the city. I understand that it’s easy to dismiss this story as too precious. Despite the modest budget, it's a glossy production that makes New York City look gorgeous. The music industry scenes with Saul (Mos Def) and other executives are cartoonish. The third act re-introduces Dave as a potential romantic foil, though Carney sidesteps the obvious ending. Even so, how can I dislike a movie that loves music this much? The scenes with Dan and Gretta strolling through the city and enjoying their favorite songs are thrilling. Stevie Wonder’s “For Once in My Life” is the centerpiece and impossible to resist. Dan and Gretta are kindred spirits with love for these tunes, and my resistance is futile. There’s no real villain in Begin Again; Adam Levine makes Dave endearing despite his evolution into a bearded poseur. People stumble and aren’t perfect, but there’s still hope through human connections and music. Carney reminds us that life’s pretty great, and art can bring us together like nothing else. Nice review. I really liked this one. Like you said, it's charming. The chemistry between Ruffalo and Knightley is unreal, and the way that music is woven into the fabric of the film is really spot on. Once, for me, was a more powerful film, but this was truly delightful. And, James Cordon is just wonderful here. I'm glad that you mentioned James Corden. I realized at the end that I hadn't mentioned him and couldn't find a spot. He's also great. Once also made a larger impact for me, but this was still very enjoyable. I had heard that this was very similar to Once so I was able to go into it and not get emotionally invested in the two main characters. This allowed me to enjoy the movie more than I did Once, which blindsided me, and not in a good way. I agree the scene where we see his view of her performance with all the added instruments is a great view into how a creative mind might work and it's probably my favorite scene in the film. Chip, I'm curious to know how you were blindsided by Once. Was it the ending? I found myself really invested in the emotions of the main characters in that film, so I'm interested to find out what didn't work for you. I had written about it before other places so I didn't want to sound like a broken record. I hated the ending of Once. To be clear, it's not that it wasn't a happy ending, although that would have been nice. I've liked a ton of sad movies. It's that the ending didn't fit with the rest of the movie. It felt very tacked on, like he was going out of his way to intentionally make it sad, but didn't invest time in rewriting the earlier part of the movie to make it flow naturally. We have two people that are obviously perfect for each other. They've gotten out of horrible relationships. He was emotionally abused by his girlfriend/wife, who left him to go to London. It's strongly hinted that she was physically abused by the father of her child. You don't move from one end of a continent to the other, to a country you don't even know the language, AND bring your mother with you, unless you absolutely do not ever intend to go back and want to get as far away as possible. So these two damaged people meet, work well together, start to heal each other...then they BOTH decide to go back to their abusive relationships, he by flying to London in a probably pointless try to win his girlfriend back, and she tells her baby daddy where she is and invites him to come live with her. There was nothing leading up to those points that ever even hinted that the two might even be considering getting back into those relationships. It was like the filmmaker just said "ok, now they do this instead." There was no transition. If he didn't want to write yet another meet cute movie where two people find the love of their life, then fine. I would have been okay with it if they simply went their separate ways at the end. ''Maybe we'll see each other again sometime." I might have even believed it if one of them decided to specifically try to go back to the old relationship, therefore leaving the other high and dry. But I can't buy both of them going back into abusive relationships, even if they chose not to explore what they had together. So when I heard everyone comparing Begin Again to Once, and I saw it was by the same guy, I knew that there was no way they would end up together. In this case only one went back to a bad relationship, and for a reason that was well-established. And the other had the gumption to cut off the bad and make a new path. That's why I liked Begin Again more than Once - the ending fit with the movie. There was a reason it ended like it did and it was established throughout the movie. I felt the writing was better on Begin Again. Thanks for the detailed explanation. It's interesting that you mention that the end of Once is sad. I don't read it that way at all. I believe that while Glen's (I'm using actors' names) girlfriend cheated on him and left, his decision to take a shot is positive. There's a good chance it won't work out, but he's going to find closure. I also believe that he's going there to take a shot at the music business. In the same way, she's directly facing the situation with the father and working to achieve a closure. I'm probably idealistic for their future chances, but I think it's possible they will re-connect once both have finalized their relationships that aren't complete in their hearts. He's still attached to his previous girlfriend and can't move forward until he deals with it. She's not ready to start anything new because of her child and an attachment to the dad. I didn't get the sense that there was abuse in her past, though I can see how you made that connection. The final shot of Glen walking towards London with a smile on his face and Marketa getting the piano isn't sad to me. It's optimistic about what they've achieved and where they both can go, together or apart. With Begin Again, the characters had good chemistry but are in very different places. He still loves his wife despite the fact that she cheated on him and must give that another shot. She needs to live as an individual after accepting the fact that she's in a different place than Dave. I'm not as sold on the ending as with Once (especially the post-credits moment), but I also don't think it's sad. Awesome review Dan. I just finally saw this recently and loved it! Ruffalo and Knightley had such a lovely chemistry and all the songs are awesome. I'm not a fan of Levine but he's tolerable here and the song at the end is actually pretty nice. Ruth, I'm glad to hear that you enjoyed it. I agree about the chemistry between the lead actors, and Levine didn't bother me. He was well-cast and probably understood the character given his background. Agree the outdoor album feels like a triumph no matter what happens with the album. It's about sharing a good time(with the audience along for the ride), and I think Ruffalo's and Knightley's character both needed that joyful feeling in their life at that particular time in their life. Good movie. Chris, good points about the importance of this album for the characters beyond the financial gains. They end up in a much better place no matter what happens with their careers. Great review here, Dan. You're right, how can you possibly hate on a movie that is so in love with music? And yes, that scene with them walking around, listening to tunes, was one of the most thrilling sequences of the year. Just perfect. Thanks Alex! Glad to hear that you also enjoyed it, especially that sequence. If you aren't too cynical, it really hits the right notes!